Want to know how to grow your email list? Are you using social media to support your email list growth? If you’re thinking of marketing tactics such as email and social media as two separate entities, you’re missing out on a lot of benefits. In this article you’ll discover tips for using social media to improve your email marketing. 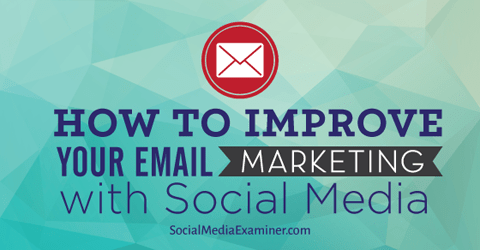 Discover how to improve your email marketing with social media. There are two things you ideally need to make most of the tips in this article. In general, both will help you grow your email list. A lead magnet is a freebie you offer people in exchange for their email address. The freebie can be an ebook, whitepaper, report, access to a tool, template, video, presentation, course, etc. 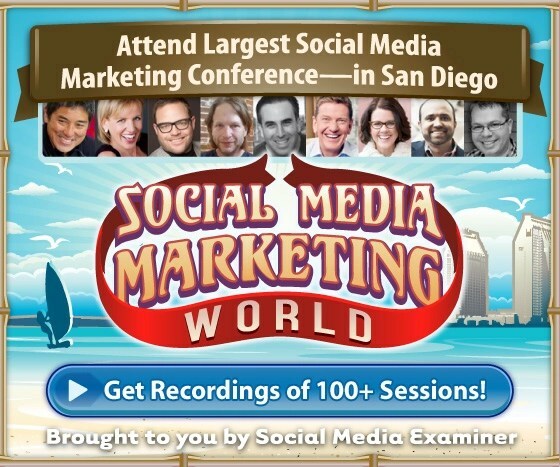 You can see a lead magnet in action on the homepage of Social Media Examiner. Example of a lead magnet promotion at the top of Social Media Examiner. You should create your lead magnet with your ideal email subscriber and customer in mind. For example, if you want CEOs interested in social media to subscribe to your email list, create lead magnets about social media geared towards CEOs instead of people who work for them. If you decide to use more than one lead magnet, you may want to create a resources section, learning center or another similar area on your website to help people find all of your freebies. 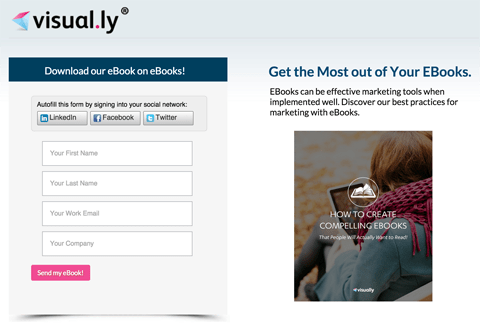 Visual.ly, for example, offers several lead magnets in their content hub. When you download one of their lead magnets, you’re taken to a squeeze page—the next thing you need for your own email marketing. A squeeze page is a landing page dedicated to converting visitors into email subscribers. Ideally, your squeeze page should include some information about your lead magnet and an opt-in form to capture your visitors’ information and email. Example of a squeeze page for email subscriber opt-ins. If you need to qualify leads for your products or services, you may want to include a couple of questions to find out who the subscriber is and what his or her needs are. But if your main goal is simply to grow your email list, fewer questions will lead to more subscribers. Armed with the URL to your latest lead magnet squeeze page(s), here are some ways to use social media to grow your email list. You have the opportunity to share URLs in two places on your Facebook page. One of those is in the main website field for your page and the other is in your page’s short description. This is a great place to share the URL for your lead magnet. The short description field is limited to 160 characters, so use them wisely to describe your business and get people to your lead magnet. Custom tabs are applications you add to your Facebook page to create a specific functionality. 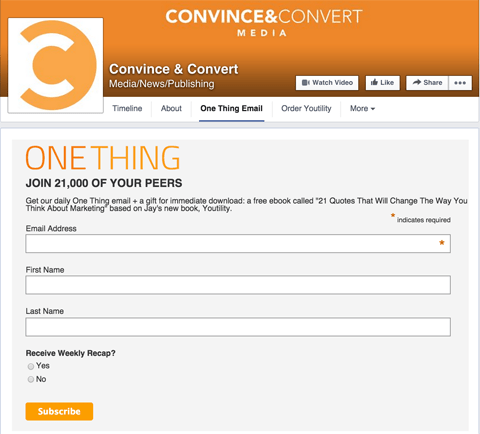 For example, the Convince & Convert Facebook page uses a custom tab to house an opt-in form for their email newsletter. Example of an opt-in form on a Facebook page custom tab. Find out if your email marketing software provides a Facebook app to create an opt-in form on a Facebook page custom tab or you can use an app like Woobox Static HTML to display an opt-in form on your own website. 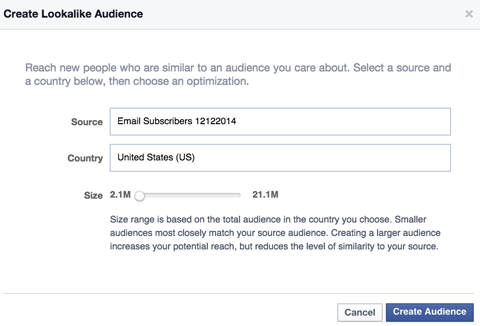 The Facebook call-to-action button can also be used to direct people to your squeeze page. Simply use the Sign Up text option and link it to your squeeze page. 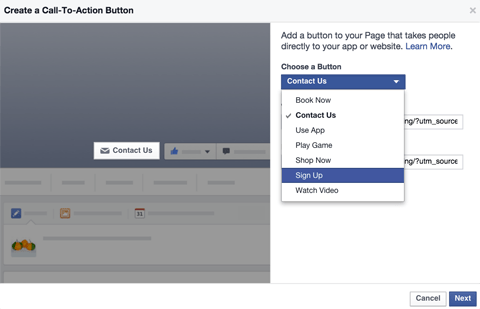 How to set up a call-to-action button on your Facebook page. To encourage people to click on the call-to-action button, you can create a custom Facebook cover photo that promotes your lead magnet and points to the button. Speaking of the cover photo, you can also use the cover photo’s description to link to your squeeze page like Mari Smith does. Example of a Facebook page cover photo promoting a lead magnet. Even if you don’t use your cover photo to promote your lead magnet, you should at least update it to include a link to your website so people can click through to it. Facebook ads are a perfect way to promote your lead magnet and get your ideal subscribers signed up to your email list. Formstack‘s ad is a perfect example of promoting a free ebook, using a great image and a download button as the call to action. 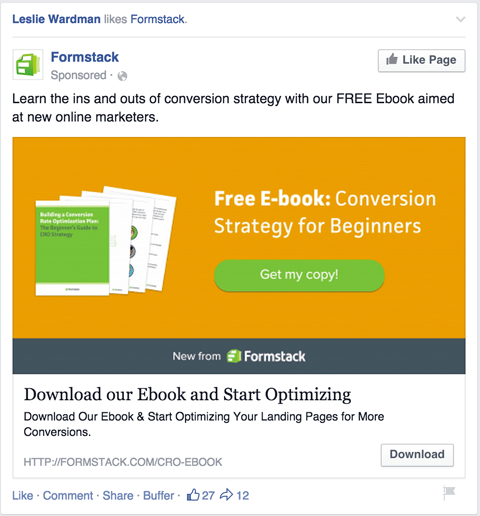 Example of a Facebook ad promoting a lead magnet. Be sure to use the interests and demographics targeting options to go beyond age and location targeting to qualify the leads who see the invitation to your email list. The more qualified your leads, the better your email marketing will perform. 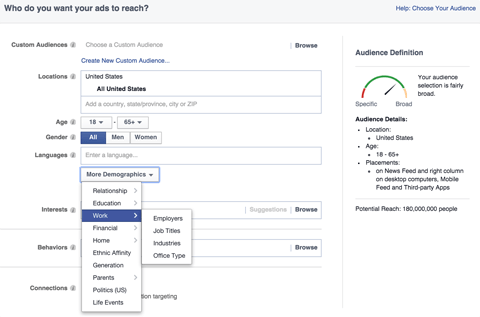 How to use targeting options for a Facebook ad. You can also upload your current email list as a custom audience and create a lookalike audience to target people similar to your current email subscribers. How to create a lookalike audience from your email list. Choose Lookalike Audience in your ad’s targeting options in the Custom Audiences field to promote your lead magnet to them. Only use this option if you feel that your current email list is fully qualified for your business. Otherwise, you simply attract more unqualified email leads. Similar to using the short description on your Facebook page, you can use your Twitter bio to promote your lead magnet and leave your website field for your main website URL. 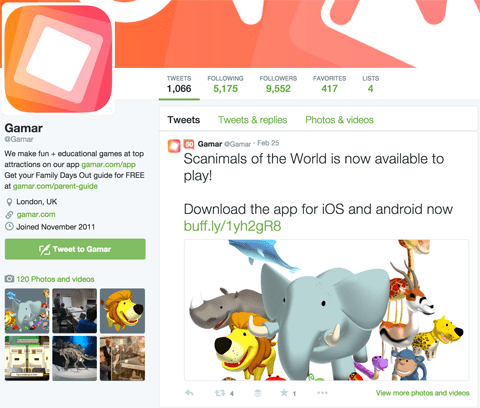 Example of a link used in the Twitter bio. Placing the URL of your squeeze page in your Twitter bio is particularly useful because only the link in your Twitter bio shows up in places like Twitter search results. Example of how a link in a Twitter bio appears in Twitter search results. For maximum effectiveness, avoid including hashtags and other Twitter profile @username handles. That makes certain there’s only one clickable item in your Twitter bio for people to act on. The Twitter lead generation card is a feature that lets you collect email addresses directly from within Twitter. You’ll find it in the Twitter ads section and the setup will look like this. How to set up a Twitter lead generation card. 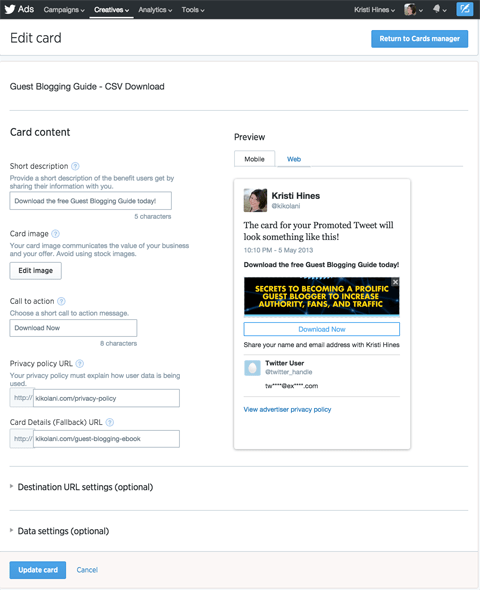 Additional configurations for specific CRM software (like Salesforce) can be found in the Twitter Help Center’s guide to setting up a lead generation card. Otherwise, you download the list of email addresses from users who opt in from your card and upload it to your email marketing service. You can find your leads by going to your cards and clicking on the Download Leads icon (the one with the right arrow). The location of your Twitter lead generation card submissions to export. To get exposure for your Twitter lead generation card, simply tweet it to your audience or promote it using Twitter advertising. To promote your Twitter lead generation card or tweets with links to your latest lead magnets, you can use Twitter advertising. Just like Facebook ads, you can target qualified audiences. On Twitter, you do this with interests and followers of other Twitter accounts (like your competitors). 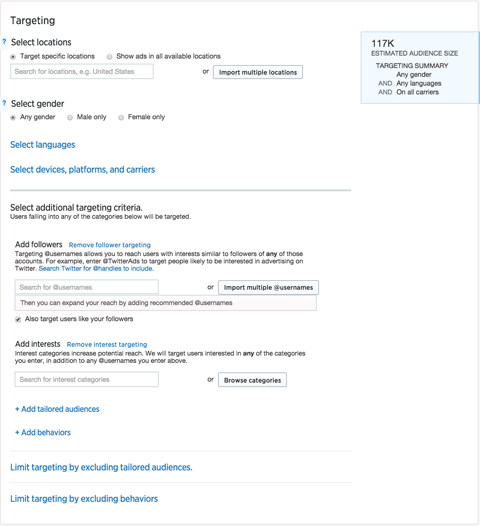 How to target specific audiences for a Twitter ad campaign. As with Facebook, you can market to custom audiences on Twitter. Start by uploading your current email list to Twitter’s audience manager. Choose your email list as a tailored audience, and then check the box for targeting users similar to your tailored audience. Then select your email list as a tailored audience again to exclude these users from ad targeting (since you don’t need them to sign up again). You can also create a tailored audience from your customer list to ensure qualified subscribers by targeting your ad to a similar audience. On your personal LinkedIn profile, you can add a Publications section that allows you to link directly to your ebooks, whitepapers, etc. You can also use this to link directly to your lead magnet squeeze pages. Example of the LinkedIn Publications section linking to a lead magnet. If your lead magnet is a tool, like a free calculator, add a link to your tool in the Projects section of your profile. Where you can find the Publications and Projects sections to add them to your profile. You can add both of these sections to your profile by using the guided profile editing option. For more visibility, add your best lead magnet to the website links in your Contact Info. This adds it to the top of your public profile so visitors who aren’t logged into LinkedIn can still see it. For businesses looking to target specific professionals as email subscribers,LinkedIn advertising offers the best professional ad audience targeting options to help you get the ideal email subscribers on your list. How to target specific audiences with LinkedIn advertising. Additional ways to promote your lead magnets and grow your email list with social media include the following. Pin a great image of your lead magnet to your Pinterest profile and link that image to your lead magnet squeeze page. Share a great image of your lead magnet to your Instagram profile andtell people to click the link in your bio. Temporarily (or permanently) change the link in your Instagram profile to point to your lead magnet squeeze page. Be sure that your squeeze page is responsive, since most people from Instagram will be viewing it on their mobile device. Create videos on Vine and Snapchat telling your fans to download your latest lead magnet. Make sure your URL is short, easy to say, and easy to remember, like yourdomain.com/freereport. You don’t have to rely solely on your own promotion tactics to get more people to your squeeze pages. You can enlist the help of people who’ve already downloaded your free ebook or report. Let’s say you offered a free ebook as a lead magnet. Simply create a landing page that thanks people for reading your latest ebook and add social sharing buttonsthat allow them to share the squeeze page for your lead magnet with their own audiences. To get people to share on Twitter, pre-populate a Twitter Share button with custom text and the URL of your squeeze page. Make sure the URL being shared is the squeeze page of your lead magnet. Otherwise, you’ll end up with people sharing your thank-you page. How to set up a Twitter Share button for your lead magnet squeeze page. Now, the tweet automatically points to your squeeze page! Sample tweet configured in Twitter Share button setup. You can configure a Facebook Like button in much the same way. How to set up a Facebook Like button for your lead magnet squeeze page. Add a LinkedIn Share button. How to set up a LinkedIn Share button for your lead magnet squeeze page. Include a Pinterest Pin It button. How to set up a Pinterest Pin It button for your lead magnet squeeze page. Once you’ve begun collecting your high-quality leads, there are a number of ways you can use social media to impact your email marketing campaigns. For example, you can use your Twitter audience to split test email subject lines. If you send your experimental tweets through Buffer, you’ll get the following analytics for each tweet. Buffer analytics for a tweet. The tweet with the most engagement can be considered the best headline, and the best headline should be used as the best email subject line. Or you can get more traction for current email campaigns by targeting your email subscribers with social ads on Facebook and Twitter. Make sure the campaign and your social ads use the same images, call to action, etc., so your subscribers are presented with a similar message no matter where they see it. What do you think? Have you learned a few ways social media can help grow your email list and reach your email subscribers? Do you have additional tips?Please share them in the comments! What does Google say about keywords, should they drive your blog or should content? Form over fashion, chicken or the egg, and keywords before content are just some of the intellectual debates that have raged as humankind attempts to come to grips with the big questions that plague our times. While the relative merits of comfort over appearance are well known, the chicken versus egg chronological lineage is still up for debate when people bend their thoughts to more esoteric contemplations. What is not up for debate is the importance of quality content over keywords when it comes to writing engaging online copy that will appear high in search engine results. Indeed, the old days of stuffing a 500-word article with 122 examples of the exact same keyword are long gone thanks to changes made by Google to their search algorithms, which punish the practice of keyword stuffing and rewards content that it perceives to be relevant and helpful to the end user. In the “Wild West” of early internet interaction, it was discovered that the search engine rankings could be “gamed” into recognizing, and singling out, websites that practiced the art of keyword stuffing. Simply stated, keyword stuffing is the practice of writing online copy to be read by a machine rather than copy designed to be consumed by a human user. 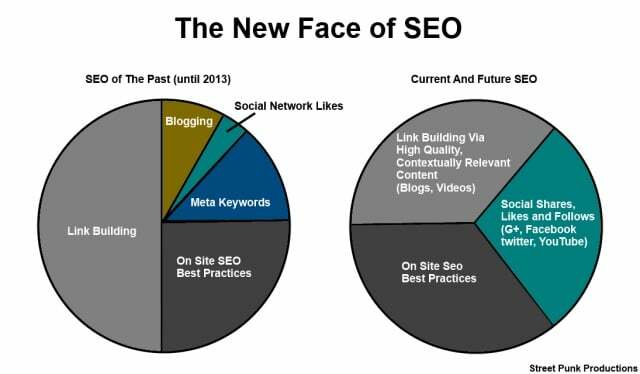 This old formula was predicated on the notion that search engines scan the internet looking for certain keyword density in response to search inquires. When the engines located articles displaying such keyword density, they posted the results in search rankings for the end-user to consume. Unfortunately, this practice dictates that copy be written for machines rather than humans, and the results rarely offered compelling or helpful information. Search engine giant Google sought to change this reality by tweaking their search algorithms in early 2012. Known as a Panda Update, the changes affected nearly 12% of all search inquiries, and the results have transformed the way people write copy on the internet. Under Google’s new protocols, the sure fired methods that drove search rankings in the past, no longer guarantee the lofty heights that they once achieved. In much the same way that you cannot discount the movements of an elephant when you are sleeping together in a twin-sized bed, the shear size of Google has assured that their changes are felt throughout the online search world. Google based their changes on observations of social media. The propensity to share valuable information on such platforms as FaceBook, Pinterest, and Twitter drove the recognition that the yardstick for high search ratings is quality content rather than the ham-fisted tactic of keyword stuffing. Panda is not about back links and anchor texts. Tidying up a messy back link profile will not help. Recovery will be re-measured once Google rolls out another update. Remove material that would probably not be shared by readers. Get rid of duplicate material on your site. This might apply to content that has been pilfered from elsewhere on the web, or it could mean pages have been duplicated across your site. Scour the site for thin material with an eye towards replacing pages that only have a sentence or two with quality engaging content. These new rubrics have resulted in a marked improvement of the quality of online copy. While the use of keywords has not been removed, their use is within the framework of a natural, in-depth discussion of the topic that leads to their use in a naturalistic way. As such, copywriters and SEO professionals are scrambling to develop superior copy that represents an improved literary frontier for those looking for quality online information and content. t’s pretty much common knowledge that these days, any business, particularly an online business, should have a blog. But how? And why? What is this platform going to do for your brand? Are you selling products? Are you building a community? Is it about building awareness? And most importantly, who’s it for? Whether you’re starting from scratch or you’ve already got something up and running, stop and get your team together! A brainstorm between your writers, marketing gurus and whoever else might be involved is a must for any successful blogging strategy. This brainstorm should be happening about once a month. If you’ve been blogging previously, get your analytics up in front of everyone – what posts have been successful? Which have been the most shared on social media? Take these factors into account when you’re coming up with topics for the next month. If you haven’t started with content yet – no problem! This next tip’s for everyone: Have a close look at your competitor’s posts. Jot down any articles that have high share-rates. You should take inspiration from these, and write a related post. Another one for the newbies: if you haven’t already decided on how many posts per week you’d like to publish, now’s the time to do it. Keep in mind you’re going to want to stay consistent, posting the same amount each week and on the same days too. Knowing these details will help you come up with a content calendar. Once you’ve decided on the number of posts you’ll be publishing per week, and per month, you’ll be able to create a rough plan for a content calendar. Do some research! Look into when your target audience is online the most. This is when you should be posting and promoting. We know that we’ve talked about knowing your audience and clients before, so we’ll keep it brief. If you know your clients, you’ll know what they’re after in a blog. Whether it’s craft DIY tips, quirky ‘behind-the-scenes’ footage or informative marketing advice, you’ll know it and you’ll be able to provide it. Knowing your audience is also knowing the purpose of your blog, which is something that should be decided straight away in order to get your strategy underway. Check out these 5 Critical Tips for Identifying Your Target Audience from Technori. If you’re just starting out, or your business is relatively small, you may have already decided that you’ll be writing the blog yourself. That’s completely understandable! Just be aware that there are a few things you should get your head around when it comes to creating great content. Firstly, you should make sure that you’re an avid reader of other blogs. This is great in terms of keeping an eye on the competition, but also knowing what’s out there in general, and knowing what’s possible within a blog platform. Reading will provide you with inspiration in terms of both structure and subject matter. Make sure you’ve got a list of go-to blog examples to devour. The above still applies to writers that you’ve hired, but hiring the right writer is also crucial. Obviously, the right person depends on the purpose of your blog. For example, if your aim is to sell a complicated product, you’ll need a writer who is also an expert in what you’re selling. This writer will need to provide a lot of insight, and so it may be appropriate that in this instance, your product manager take on the blog themselves, or at least train the person you’ve brought on board. Make sure your writers are great at creating catchy headlines. Obviously, these are the first things your audience are going to see – you want your headlines to inspire enthusiasm and interest, as well as be optimized for SEO (but we’ll get to that). It’s one thing for you to know your audience, but make sure your writers know it too. Make communication with your writers a big priority – they should know not only your audience, but the goals of the business itself, what’s it all about? Check out these guidelines for creating great content. The importance of the language you use on your online platforms should never be underestimated, but in this case – this isn’t all an editor and a style guide are for. Of course you don’t want spelling and grammatical errors throughout your content, but there’s something as equally important: consistent style and tone. It doesn’t matter if you have one writer or twenty – you want all your written content to be of a similar nature, it needs to represent your brand after all. Early on in the content creating process, put together a style guide for your writers. This can list everything from preferred spellings and topics to cover to how to format headings. If your writers follow this carefully, you will be rewarded with consistency throughout your whole blog, no matter how many writers you have. Installing analytics is a must for every website owner. These are brilliant tools that allow you to track and measure your success, enabling you to identify successful posts, and use this information to create similar posts. The most commonly used tool is Google Analytics, which offers an extensive breakdown of your site, traffic and audience. Some of our favourite features? Audience. 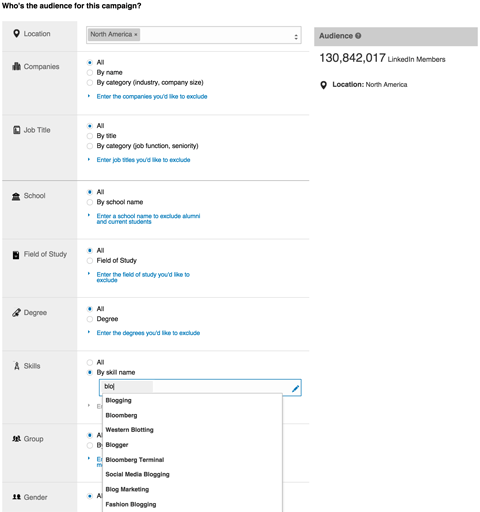 This lets you view your demographic, their interests and behavior. Acquisition. 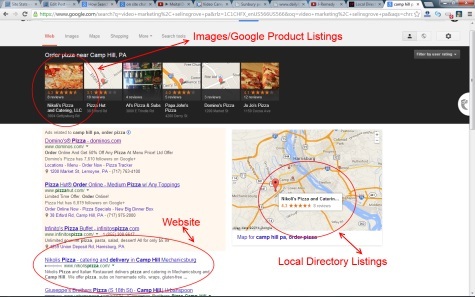 See where your traffic is coming from – is it direct or from an organic search? Is it from social media or an email marketing campaign? ‘Real Time’. See how many people are on your site at this exact moment; what they’re looking at and where they are in the world. It’s amazing what you can learn about your audience and your own content by reviewing your analytics on a regular basis. Did we mention it’s free? If you know your audience you’ll have a rough idea of what they’re searching for when they hop onto the world wide web. Once you’ve got this in mind, you can play ball seriously. There are a number of keyword planning tools available for you to choose from. There’s Google Adwords Keyword Planner which can tell you how often a term is searched for each month, as well as suggest similar terms to use. 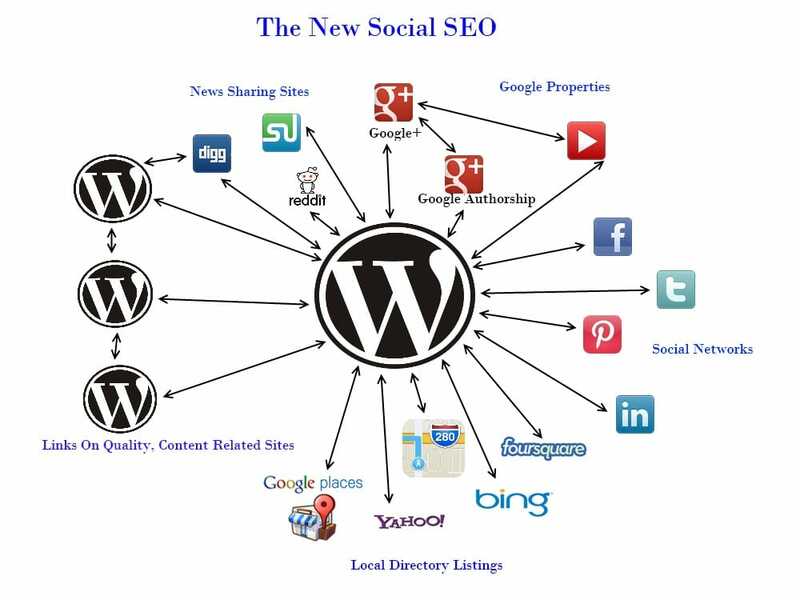 This is one of the few free tools available, some of the paid services include Market Samurai and Raven, which also offer SEO (Search Engine Optimization) Packages. Another tool we’ve just discovered is ReSearch.ly. This service filters conversations from 1000 days of social data so you have insight into your target audience’s “influence, sentiments, demographics and psychographics”, allowing you to “get inside your reader’s head”. ReSearch.ly offers newbies 10 free searches before they have to subscribe, so have a play around, and see if it’s something that could work for you. Once you’ve done your keyword research, you can get your writers on board and discuss how to integrate these terms into your written and visual content. Think outside the box here, use your keywords in your image captions and alt tags, if possible have a category title using a keyword… Be sensible though, you still want your content to be super easy to read and share-friendly. If all of this is new to you and you’re a little confused – no problem! Check out Moz’s Beginner’s Guide to SEO & Keyword Research here. There’s one more thing to consider before you put your blog post out into the world: Links. Your post should be an authority on whatever subject you’ve chosen, but there will always be offshoot subjects you haven’t covered, or have covered in the past… Never miss an opportunity to provide your readers with more information, whether it’s from your own site or a fellow blogger’s. Creating internal links (these connect from one of your posts to another post on your site) are great because they keep your visitor on your site, exposing them to more of your content. This also means that you and your site keep more of the ‘link juice’ (yes, that’s a real thing). Alternatively, by linking to an external source, not only are you showing your readers that you’re a good sport, but you’re also starting a relationship with like-minded bloggers and paying it forward. This encourages others in your industry to interact with you and your brand, which ultimately brings more traffic your way. That’s right, we’re finally here. You’ve done all the grunt work; the brainstorming, the researching, the writers’ training, the style sheet and you’ve trawled through your analytics… Now’s the moment you’ve been waiting for. Hit ‘Publish’ and give yourself a pat on the back, a cheeky afternoon beverage or a nap (or maybe all three). You deserve it. Unfortunately, the work doesn’t end there. Now you’ve got to give your latest post the best shot of reaching the most people on the web. Firstly, be sure to include sharing options at the bottom (and top) of your posts. You want people to share your content quickly and easily, which means making sure there are as few steps for them as possible. Next, promote your new post across all your social media platforms – use call to actions to grab attention and prompt interest. Another detail to remember – get your writers on board with social media sharing as well. It’s equally beneficial to them, as it gets their name and work out there for readers, but creates brand awareness for you as well. Today, small business owners are busier than ever trying to run their companies while handling marketing and sales, too. 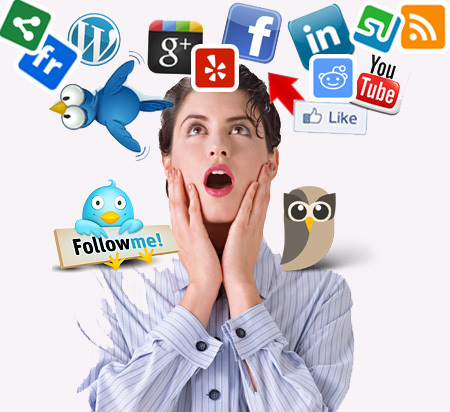 An important part of marketing today is social media. For many small business owners, the world of social media is still foreign territory, and finding the perfect strategy that actually works can often be difficult. So how do you know if what you’re doing is really hitting the mark? Here are 11 signs that your small business strategy isn’t working. If you’re doing any of the things on this list, chances are your strategy is falling flat and you’re missing prime opportunities to use social media to engage, inform and promote. 1. You delete negative posts. Negative posts about your brand can be shocking, scary and hurtful. One of the key mistakes small business owners make is taking negative comments personally. Most often when you see a negative post about your brand, the person posting isn’t talking about you. They’re talking about your product or service. Instead of hitting the delete button when you see something negative, think of it as an opportunity to engage. But make sure that you directly address the negativity head-on. Don’t try to sugarcoat your response. For example, if you own a delivery service and a customer makes a negative comment about your company because their package was late, don’t panic. Instead, let the person know that you will direct message (DM) them with a response and take care of the issue. Once the issue is resolved, go back to the original post and let your followers know you’ve handled it. In 2011, a Harris survey looked at customers who posted negative reviewed during the Christmas season. The survey found that 68 percent of customers that left negative reviews got a response from the business they were reviewing. As a result, 18 percent of them became regular customers and made additional purchases. Of the customers who received a response from their negative post, 33 percent of them actually posted something positive after and a whopping 34 percent deleted the original negative post. So don’t ignore negative posts. Deal with them directly, and you might just turn a negative into a positive! 2. You don’t have a solid company social media policy in place. Most small businesses don’t have a formal social media policy in place. If you’re in that boat, you really should take the time to develop one. Think of it as a road map to helping your promote your brand better on social media. If you define procedures and protocols upfront for how often you’ll post, who will maintain the accounts and how you will handle negative posts, it makes it a lot easier to run your accounts and spring into action quickly when something goes wrong. Most social media platforms have an automated message feature, but it doesn’t mean you have to use it. When many social media platforms like Twitter and Facebook were first introduced to the public, the automated message feature seemed like a convenient way to thank people who followed you. Today, automated messages are widely considered annoying and impersonal. Instead of sending the same message to every new follower, take the time to send personalized thanks when you can. Remember, you don’t have to thank every follower, but it’s a good idea to thank those that stand out. For example, if you own a restaurant and the food columnist for your local newspaper starts following you, you may want to reach out directly to establish an ongoing dialogue rather than letting an automated message do it for you. 4. You’re not tracking what others say about your brand. Many small business owners make the mistake of thinking that consumers only post about them on their brand page. In reality, consumers post about brands everywhere — Facebook, Twitter, Pinterest, Instagram and review sites, to name a few. While it’s a great idea to monitor your own social media accounts to see what people are saying about you, it’s an even better idea move to using a social mention tracking tool to find out what people are posting about your brand around the Internet. Social Mention is a great free tool for doing this. Visit http://SocialMention.com to check it out. 5. Your updates are sporadic. If you’re not updating your social media pages on a regular basis, you’re missing out. You don’t have to post multiple times a day, but you should at least make a few posts a week to keep your followers, who are essentially your customers, engaged and excited about your brand. 6. You don’t know the difference between a reply and a mention on Twitter. Did you know that if someone posts something on Twitter and you start your response with @, you’re limiting the number of people who are going to see the reply? For example, if @customerx posted something about @xyzbusiness and that company starts their reply with @customerx, it will only be seen by the customer and the business. That’s a reply. To make sure it’s seen by all of your followers, add a period in front of it like this — . @customerx — to make it a mention. 7. You overuse hashtags in your posts. Not every word in your post needs to have a hashtag. In fact, hashtagging every word is going to make your post harder to read. Instead, use hashtags sparingly. Try not to use more than three per post. 8. You don’t proofread your posts. Grammatical errors make your posts hard to read and reflect poorly on your brand. Proofread everything you write before you post it. 9. You only share things related to your brand. This is a cardinal sin of social media. Remember that your purpose is to engage and get to know your customers. Your brand isn’t the only one they follow, and it’s certainly not the only thing that is of interest to them. Be sure to spend some time browsing your customers’ page, find out what things they like and leave positive comments. This is an excellent way to foster lasting relationships with your customers online. It also shows your customers that you are interested in them, too. 10. You make it hard to retweet your content. It’s a fact that Twitter gives you 140 characters to post, but it doesn’t mean you have to use all of them. In fact, you should leave about 20 or so characters that can be used by others who retweet your content for the “RT @customerx” that will automatically be part of the retweet. This makes it easier for people to share your content quickly with no hassles. 11. You don’t retweet your followers’ content. While you definitely want to make it easy for others to retweet your content, you also have to spend some time doing a little retweeting yourself. Find content from your followers that you find interesting and take a minute or two to retweet it. Remember social media is a two-way street and engagement is the key to success. This is an amazingly insightful article about a subject that it near and dear to my heart (for obvious reasons) and some not so obvious reason. I love to learn new thing, I always have. In fact I have had to practice quite a bit of restraint, and condition myself to not chase after every new trend and tool. Having said that I do agree, completely with Kelvin’s assessment of the Social Media Marketers landscape. In a nut shell, evolve or die. Almost three years ago, right after university, I talked to an awesome HR professional about my career prospects. While she gave me a lot of great info that day, one thing that stuck to me was her advice not to pursue positions that are only about social media. Her reasoning was that more and more marketing and business professionals were learning social—meaning, the need for professionals who specialized in this space was about to decrease. Persuaded by this reasoning, I avoided roles such as “Social Media Manager” and even “Community Manager.” I ended up with a position in PR, which had some elements of social but mostly included media relations. Fast forward to last year and I’ve decided to leave the world of PR to take on a social media role. The thing is, I liked PR—and quite frankly, I excelled at it—but it wasn’t my number one passion. Last year, Hootsuite’s Ryan Holmes proclaimed the role of social media manager dead. He cited a study that found that the growth in positions with the title “social media manager” has slowed down by 50% between 2012 and 2013. Reading Ryan’s blog post—and now that I’m fully entrenched in social media management—I can’t help but re-visit that HR person’s advice. What if she was right and my current role becomes obsolete soon? 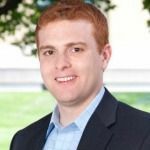 What can I do now as a social media manager to make sure that I’m still in demand in the future? After thinking about this, I’ve come to a simple conclusion: To remain relevant and employable, I have to evolve from a social media specialist to a marketing leader. 1. Acquire new (but related) marketing skills. Content marketing has been hot for a couple of years now—and for good reason. Many marketers are learning that providing true value through content is a great way of increasing brand awareness and turning prospects into leads. Influencer marketing is another trend that will likely grow in the next year or so. The point is, there will always be something new in marketing. Learn these trends because some of them will stick. You also want to acquire older—but still very essential—marketing stills. The lessons I’ve learned in PR in my previous role are applicable to influencer marketing, for example. 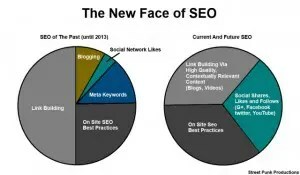 My basic SEO knowledge helps me drive organic traffic to our company blog. Email is still very hot, and learning MailChimp and other similar systems is a good skill to have. Keep learning. Take some time everyday to peruse blog posts, to try new apps and networks, and to get your hands on new technology. Embrace your inner geek. Readinsights from creative and successful business leaders. By diversifying our skills and acquiring new ones, we can ensure that our marketing skills are up-to-date and relevant. 2. Become the customer advocate in the marketing team. In an IBM C-suite study, 55% of CEOs said that customers have influence on a company’s strategic vision and business strategy. Executives are waking up to the fact that they need to involve their customers in every business process. So how does this relate to you? Social media managers fundamentally understand the value of listening to and engaging customers. Together with the folks at customer insights, we’re in a good position now to be the customer experts in the marketing team. Use social media to capture trends that will affect your company’s future. Trends like the Internet of Things, wearable tech, the collaborative or sharing economy, and big data have the potential to disrupt many industries. Listen on social to determine how these trends might affect your industry, and then share what you know to your CMO and the rest of your marketing team. By becoming customer-centric, we do not only demonstrate the true ROI of social media—we’re also positioning ourselves as experts in the organization, which might help when we make career moves in the future. 3. Write—and then write some more. Marketers require great writing skills, and they will continue to do so in the future. If you’d like to stay in the marketing field, learn how to organize your thoughts and to write well. From blog posts to emails, from landing pages to ebooks, writing has a lot of practical marketing applications. Whatever is the next hot trend in marketing, you can bet that your writing skills will be required. So if you’re already blogging, keep on doing that, and find a way to improve your craft. If you’re not blogging yet, now’s the time to do so. I have some tips in the embedded Slideshare. Get writing! 4. Learn how to market to the entire sales funnel. Let’s face it: most (if not all) social media efforts help with top-of-the-funnel stuff. But many CMOs are looking for people who understand the entire sales process. Those who can drive prospects from awareness to information and evaluation are a lot more valuable to brands. You can provide more business value if you know how your skills can contribute to the entire funnel. 5. Build your online reputation. Here’s the thing: The more real influence you have—and the stronger relationships you have with people—the less likely you’ll ever be unemployed. As social media nerds, we are experts at building communities for brands. The same marketing skills that allow us to build brands can also help us build our own personal brand. Don’t wait until you’re in need of a job to start enhancing your online presence. Use LinkedIn to its full advantage. (Some tips in the embedded presentation.) Build your Twitter following (and always keep your eye out for possible future employers). Maintain a credible blog that provides real value and that communicates your expertise. As long as people use social networks, it’s unlikely that social media managers will completely go away. Yes, social is “part of everyone’s job, or soon will be,” but businesses (particularly enterprises) will need specialists who will keep up with the ever-evolving social media landscape. Given that social media is still expanding and continues to evolve, it will probably take years before our position becomes 100% obsolete. But just like any other roles, social media managers like myself need to evolve—and the time to evolve is now. Brands need us: after all, most of us understand the value of engaging customers, and we know how to communicate with people using digital technologies. To prepare for the future—and to bring even more value to our employers and/or clients—let’s also make sure that we’re acquiring the skills that businesses need tomorrow. P.S. I wrote this article as part of the LinkedIn’s #MyIndustry campaign. For more social media rants, I invite you to read my marketing blog. If you have any comments on this post, please tweet me @kcclaveria. Social media contests are a great way to connect with consumers in the ever evolving web. Social networks are natural venues for users to share information quickly. Since I am a big fan of giving real world examples whenever I explain a specific tactic, I wanted to highlight a contest I found recently. I’ll walk you through how I would go about promoting it and how I might actually do it differently. I would like to point out a few things here about this contest – first of all, they are not a client of Ignite Social Media and secondly, I don’t know what they’ve done to promote it so far. Before I get into promotion tactics I have to point out something that is extremely important, but that a lot of companies don’t do well. 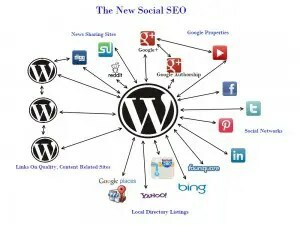 If you implement a contest properly, people will be linking to your site. 9/10 times people will use your contest title as the anchor text, so make sure you take advantage of a well-thought-out contest title before you even start thinking about promotion. In this example I would have used the following contest title: Beneful Dog Food YouTube Video Contest. Ranking for “Incredible Small Dog” is probably not going to amount to many sales of the Beneful dog food product line. For the Small Dog Video Contest we are dealing with YouTube as the means for entry. As someone who understands the power of search, I am never a fan of hosting linkable assets off of my main site. It is also worth pointing that hosting a custom channel like they have rolled out on Youtube is not cheap. More often than not contests are very linkable. As I will outline later on it is relatively easy to drum up some press for your contest, and more than likely they will link to the destination of the contest, where it is hosted on your site. I suggest hosting the contest on your site, and leveraging tags to aggregate YouTube videos. That way, contestants are still using YouTube, which is widely established as the de facto video hosting source, and people are familiar with the interface. Now that I have those two main issues out of the way, let’s explore how one might actually promote the contest. This can be the toughest aspect of contest marketing in my opinion, especially because videos have a high barrier of entry. That’s because videos are not easy to make and share when compared to other forms of online content creation. Using the example above, we can utilize custom search queries inside of Google to help us identify dog owners who have channels on YouTube. This will help us target individuals who we know have created dog videos in the past. Then through some additional social searching we can identify some form of outreach, whether that is via email or other means, to let them know about the contest. Contests are being widely adopted by many big brands currently and are the sort of tactic that even small to mid-sized businesses can implement with success. Since there is an influx of so many contests in the market, however, it can be difficult to cut through the similarities. Approaching contest marketing from the angles outlined above will help ensure success for your campaign. Do you have any additional tips to add? Have you run a successful social media contest? It seems that Google is venturing into sci-fi territory with its latest acquisition. Or is it? Google has shelled out $500 million to acquire the UK startup DeepMind, according to TechCrunch. DeepMind focuses on artificial intelligence and machine learning. To date, Google’s true intentions regarding the acquisition of DeepMind have not been released. Google X Labs produces some innovative and helpful products (i.e. Google Glass and self-driving cars), so there is no shortage of opportunity to utilize artificial intelligence there. Google’s primary mission, though, is “to organize the world’s information and make it universally accessible and useful.” So it may very well implement new applications in artificial intelligence in more practical instances such as its Web search algorithm instead of trying to create self-aware machines. 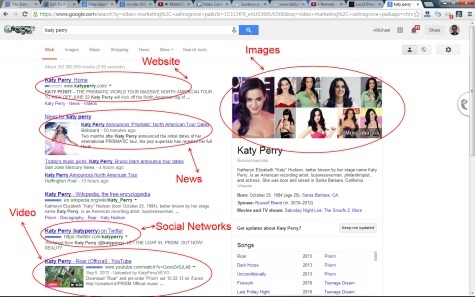 Currently, Google’s internet search results rely on information and content that is properly labeled online. This is why SEO still involves a lot of care toward meta information, word content and descriptive anchor text for links. The exception to this is Google’s image search, which uses a mathematical algorithm to analyze image features to find the same or similar images that have been posted elsewhere online. But these internet search algorithms are woefully inadequate when searching for videos, audio files and interactive content like video games. Yes, these file types can be located when they are labeled correctly in their titles or descriptions, but otherwise these media types are completely missed by search engines. Here is where artificial intelligence would be useful. By 2012 Google had already developed a neural network that made use of machine learning to recognize the content within YouTube videos. In this case, a “deep learning” model of artificial intelligence was used, where the machine’s conclusion was not based on pre-loaded knowledge and detailed sets of conditional statements but rather on a framework where the machine was able to create its own concepts. The result of this experiment: the computer was able to create the concept of, and identify, a cat, according to the Verge. The fast-paced development of technology in the 21st century as well as our fascination with the possibilities presented to us through the world of science fiction has built up our belief that science makes just about anything possible. While we have in fact made extraordinary strides in technology thus far, we are still a long way from creating a machine with the intelligence to match anywhere near that of a human being. The beliefs and preferences of those who work at Google, as well as the opinions of the general public, do not determine or impact our search results. So while Google does not ultimately feel responsible for the search results it provides, that doesn’t necessarily mean Google doesn’t want to offer users the refined search results they desire. Currently Google Safe Search for Web images censors search results by examining the content of the page hosting an image. It also analyzes images for being potentially explicit, although Chris Crum fromWeb Pro News found that many webmasters are finding their innocuous content blocked from search results because of such efforts. So it seems that an internet search engine that can reliably vet Web content is still an elusive goal. Deep learning in artificial intelligence forms the foundation for automated machine learning. This can be applied to accomplish relatively simple things such as creating smart home appliances that can program themselves based on the unique activity in a home, teaching a robot how to climb stairs or, more importantly, understanding the purpose of stairs. Deep learning’s goal is to have the machine learn how to climb stairs and why they are used, instead of being programmed step-by-step on how to climb them. In this respect, the idea of machine being intelligent enough to be on par even with a seven-year-old human is still a good way into the future, although some experts say creating such a machine will be possible within the next 100 years. 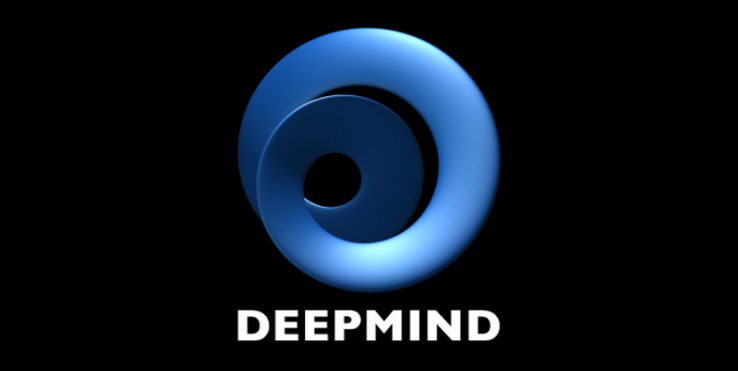 DeepMind’s moniker comes from an area of machine learning called deep learning. Deep learning tries to mimic the natural neural network in the brain by processing data by means of context, memory and positive reinforcement. Some of DeepMind’s coolest work has been training software to play video games where no information or rules about the video game were loaded onto the program before it started playing. The software learned how to play the video solely upon the positive/negative reinforcement of the game performance or score. At one point, Facebook was also interested in acquiring DeepMind, according to Re/Code. Facebook’s interest may have lied in deep learning’s potential to make targeted online advertising truly dynamic. It turns out, however, that the world of deep learning experts is pretty small, with a good number of them still in, or fresh out of graduate school. So to say that the professionals at DeepMind and their work are in demand would be being quite modest. In the end it seems that Google and other companies are looking towards the latest trends in artificial intelligence and determining how to use them in practical applications. While artificial intelligence will always be the mainstay of science fiction fantasies where it is a key feature of the autonomous computers and robots of the future, it’s fascinating to see how artificial intelligence is being used today to enhance our own personal daily technology uses and experiences.